The DAT Prep Course has designed to be a comprehensive review of all subjects covered in the DAT. 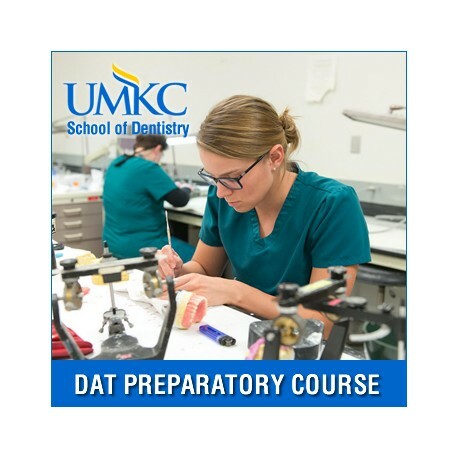 To help you prepare for the DAT, the University of Missouri - Kansas City School of Dentistry offers an On-Demand Online DAT Preparatory Course. The course is designed to sharpen your test-taking skills and your knowledge in the subject areas tested on the DAT, including math, statistics, biology, general chemistry, organic chemistry, perceptual ability, and verbal reasoning. This unique DAT Prep Course will allow you to review each subject area in a series of on-demand mini-lectures on your computer from anywhere in the world. Access to these mini-lectures will be available for 90 days following the completion of the live sessions. Additionally, you will be able to view pre-recorded live session to go over exam-style questions on your computer from anywhere in the world. All handouts will be in digital format and can be downloaded to your computer. The registration fee to participate in the course is $550.00 which includes not only the course but also the CD-ROM "Top Score Pro for the Dental Admission Test" produced by ScholarWare. Sign up now! Space is limited for each course, so be sure you get a seat. This course is available for registration at anytime. Diversity of Life: Biological Organization and Relationship of Major Taxa (Six-Kingdom, Three-Domain System) - plantae, animalia, protista, fungi, eubacteria (bacteria), archaea, etc. Structure and Function of Systems - integumentary, skeletal, muscular, circulatory, immunological, digestive, respiratory, urinary, nervous/senses, endocrine, reproductive, etc. Evolution, Ecology, and Behavior - natural selection, population genetics/speciation, cladistics, population and community ecology, ecosystems, and animal behavior (including social behavior). Individual Reactions of the Major Functional Groups and Combinations of Reactions to Synthesize Compounds - alkene/alkyne, aromatic, substitution/elimination, aldehyde/ketone, carboxylic acids and derivatives, and other. For each area listed above, the following sub-areas apply: general, one-step, and multi-step.